The Eurovision Song Contest’s official website has been nominated for a Lovie Award. The Awards celebrate all things European internet and eurovision.tv needs your votes! Every year, the Lovie Awards pick out and honour some of the best features on the European Internet, such as websites, popular TV shows, best social video series, online advertising, branded entertainment, etc, all of this being accepted in a total of seven native languages. The Lovie Awards’ aim is to acknowledge the unique and remarkable talents and features the European Internet community has to offer. 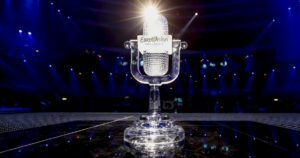 This year, in the 7th edition of the Lovie Awards, the Eurovision Song Contest’s official website, eurovision.tv, has been chosen as a nominee for the People’s Lovie Award in the television category. The lines close on Thursday, the 5th of October! We would like to wish eurovision.tv good luck!